My friend Angela posted discussion the other day about setting concrete goals to move forward in her projects. It occurred to me that I don’t think I’ve shared the method that I started at the end of last year for doing just that. At work one day last year, I noticed a book on a co-worker’s desk, “The 12-Week Year.” It was all about how businesses aren’t reaching their goals because a year is too far out on the calendar to excite anyone. Companies think, “Oh, we’ll get to that next week or the next month or next quarter.” And whatever IT is, IT doesn’t happen. I don’t own a business but I do own my own time. I’ve always felt that I don’t get enough done (though my husband says I do quite enough and I suffer from straight-A student syndrome). After I found this book I thought, “Hey, I could do that with my goals…whatever they may be! I didn’t tell anyone I tried to do this last year because I didn’t want to fail. (I have this weird penchant for not succeeding when I announce plans.) But, I succeeded. I met my goals. I am now in my 3rd 12-week goal setting period and I am well on track for meeting my current goals. If you feel like you can’t get a handle on things, map out your goals for the next 12 weeks and follow the SMART acronym. Make the goals Specific (a new doublet), Measurable (I will finish it), Achievable (work on it for an hour a day), Relevant (it’s for an event), and Time bound (the event is 8 weeks from now). Since the fabulous trip to NYC to shop, I have to rethink some of my sub-goals. I’m going to have to dovetail two sets of goals into one reasonable set. I need to modify a couple of my 12 week goals to include sewing 8 new garments before the next trip to NYC. 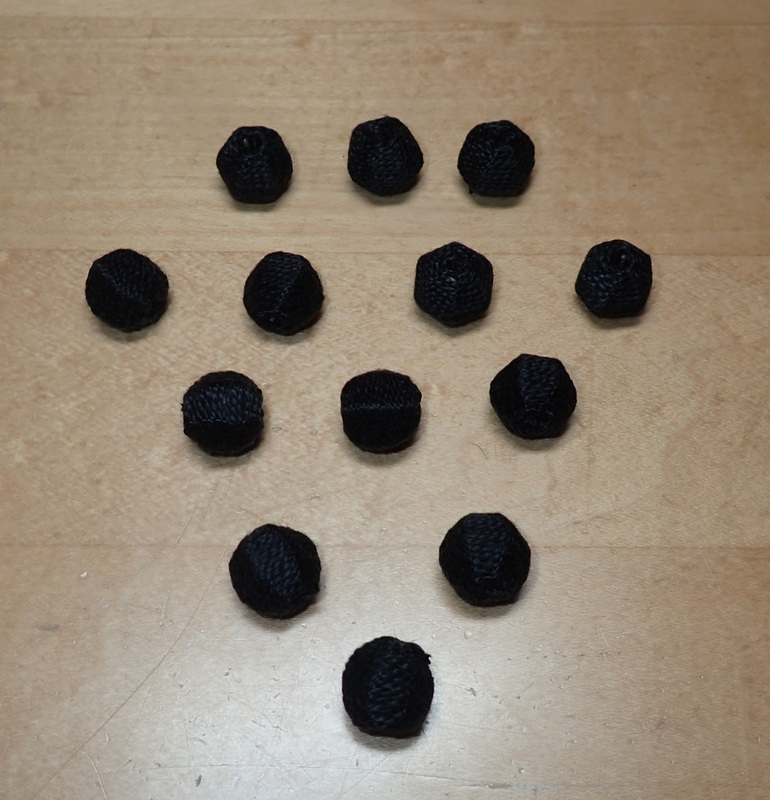 To that end, here are 13 thread-covered buttons in progress. I need to tart them up with some violet silk accents. 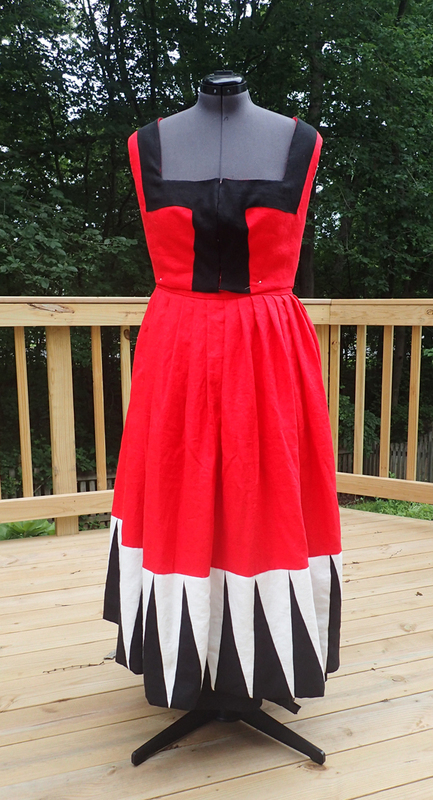 After taking a break for nearly a year, I came back to sewing with a vengeance. 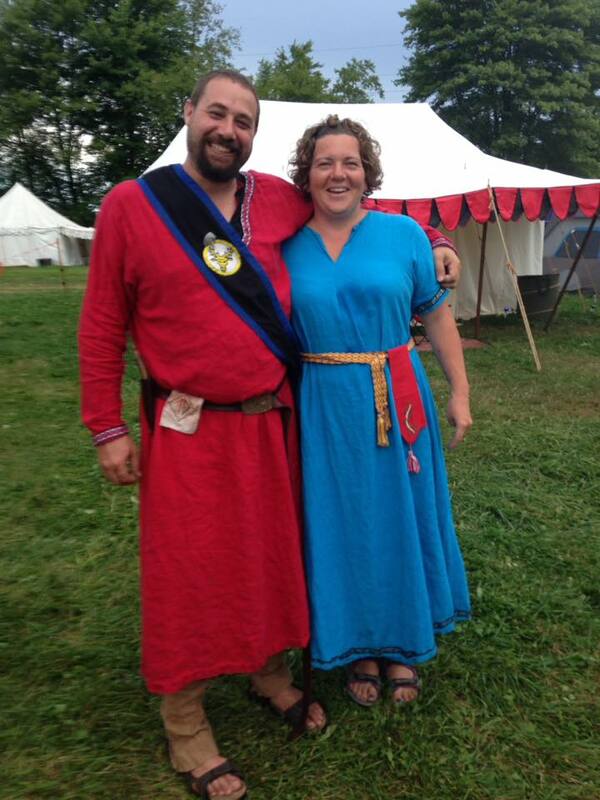 When Karin was selected to be the Baroness, I offered to make her investiture dress. 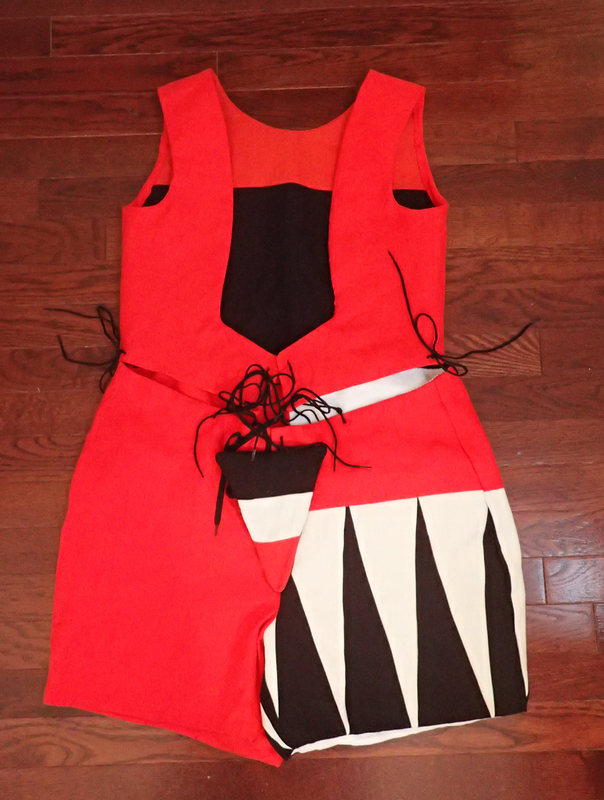 I spent about 50 hours on the design, construction, fittings, and finishing for both of Karin’s outfits. 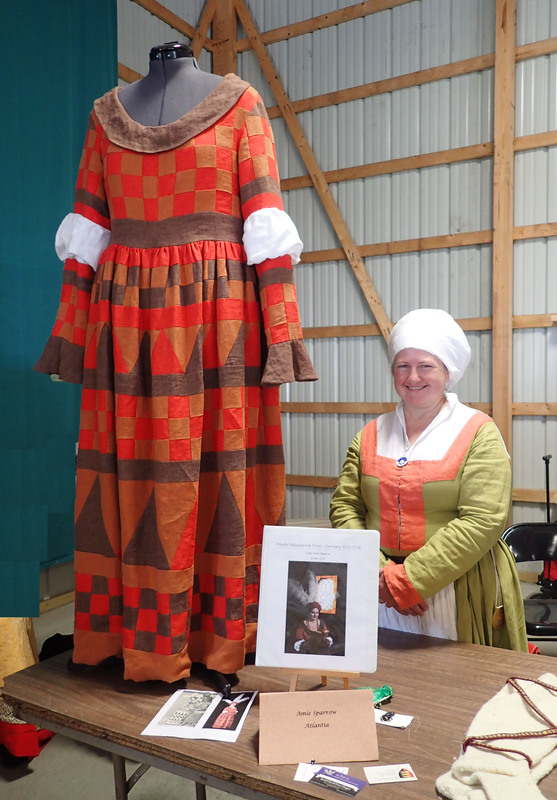 I based her dress on the German woodcut below. Here is the concept art. Notice that I made a tiny hat because she can’t wear the current coronet with a wulst. 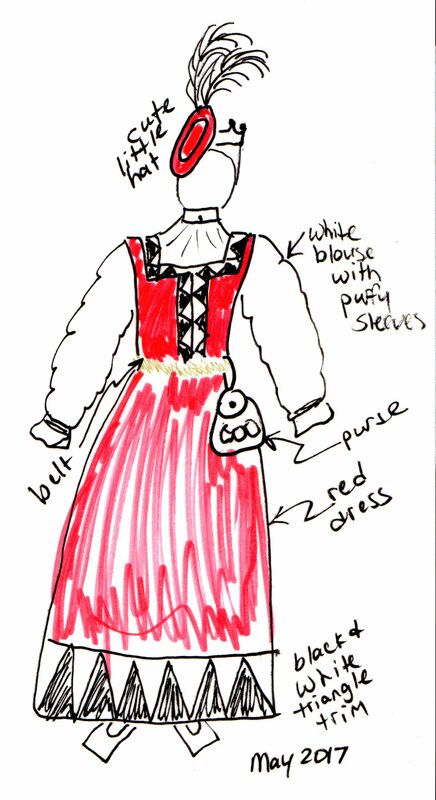 The idea was to make her a mix and match outfit, where the bodice could be attached to either a skirt or shorts. Long story short, I couldn’t make it work. 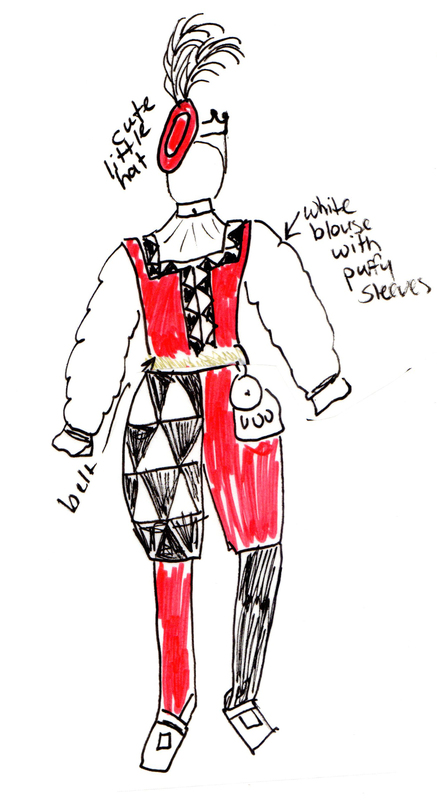 So, I made a Landsknecht male top for her shorts. 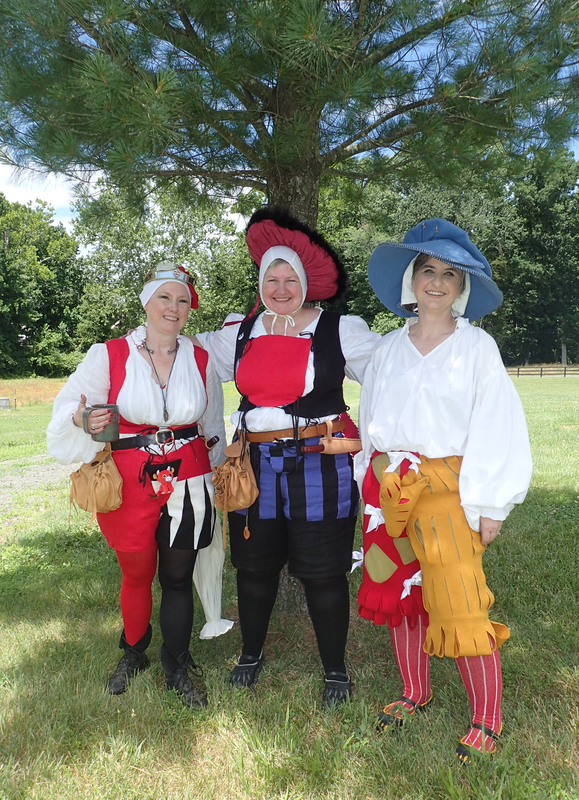 The Baronesses, Present and Past. Krista Joy Crosby made Karin’s shirt (hemd). 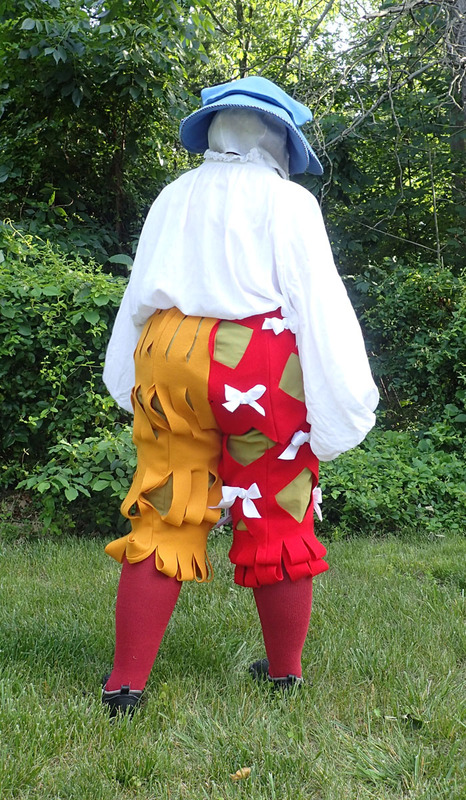 Wearing Landsknecht Shorts. I made all the shorts, codpieces, vests, and hats. I also made my own shirt. Let’s address the big sweaty elephant in the room first. The weather was sub-optimal. I’ve been at hot Pennsics before but I’ve never been to one that was hot and humid. 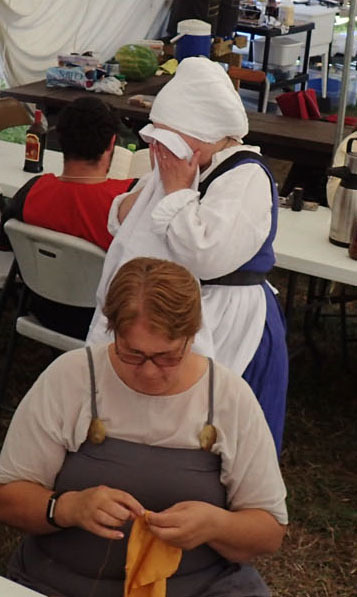 (Someone cheekily described this year as Permadamp Pennsic.) I have never been damp for an entire week. 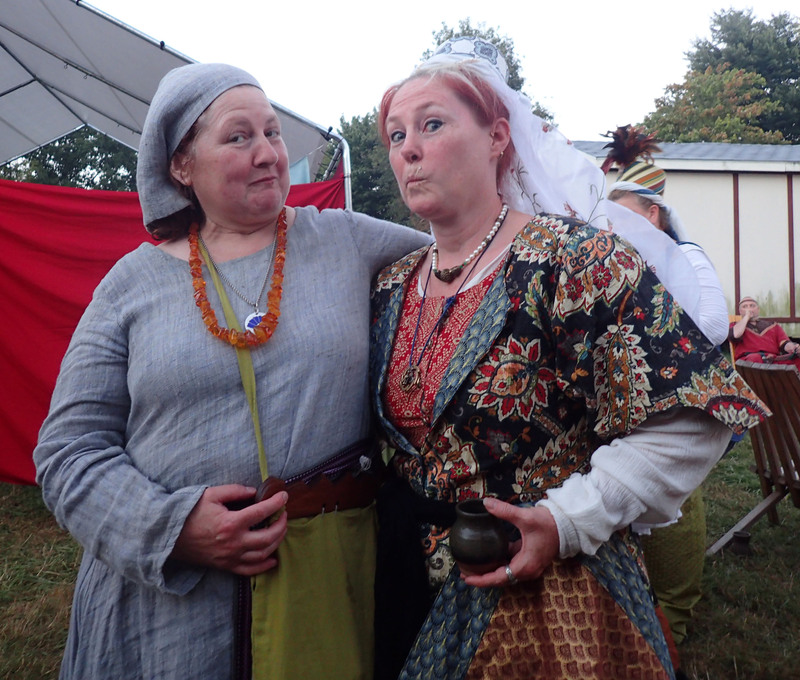 This is the first year that I had both a hotel room and a tent onsite with the Barony of Stierbach. I had an idea that I would sleep onsite sometimes. Ha-ha. Nope. I was able to last about 8 hours a day onsite and not even that towards the end of the week. I felt like a wimp but seriously, could not cope. I never made it Atlantian Royal to see the Artisans Easement. I didn’t make it to a single court. 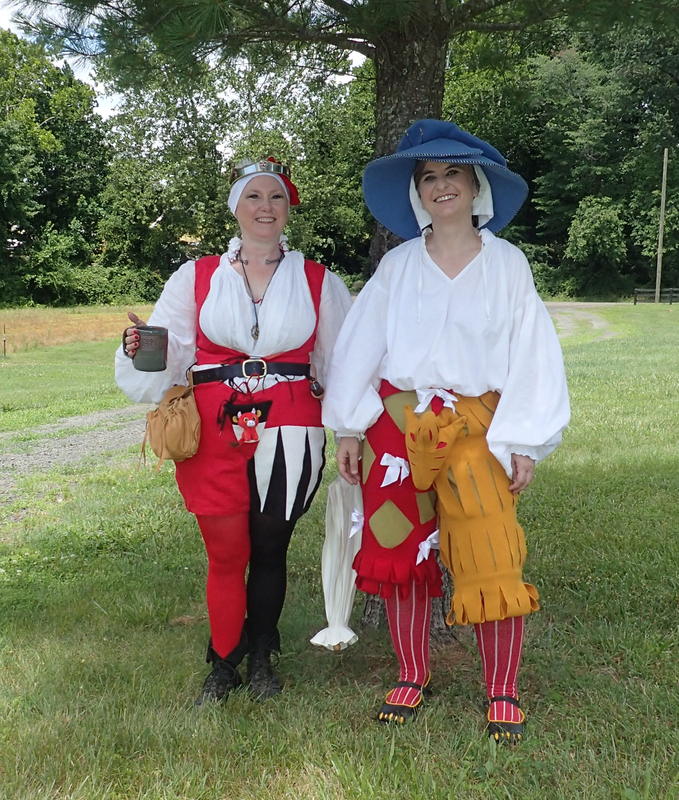 I barely had the stamina to shop, which is a shame because Pennsic shopping is awesome! 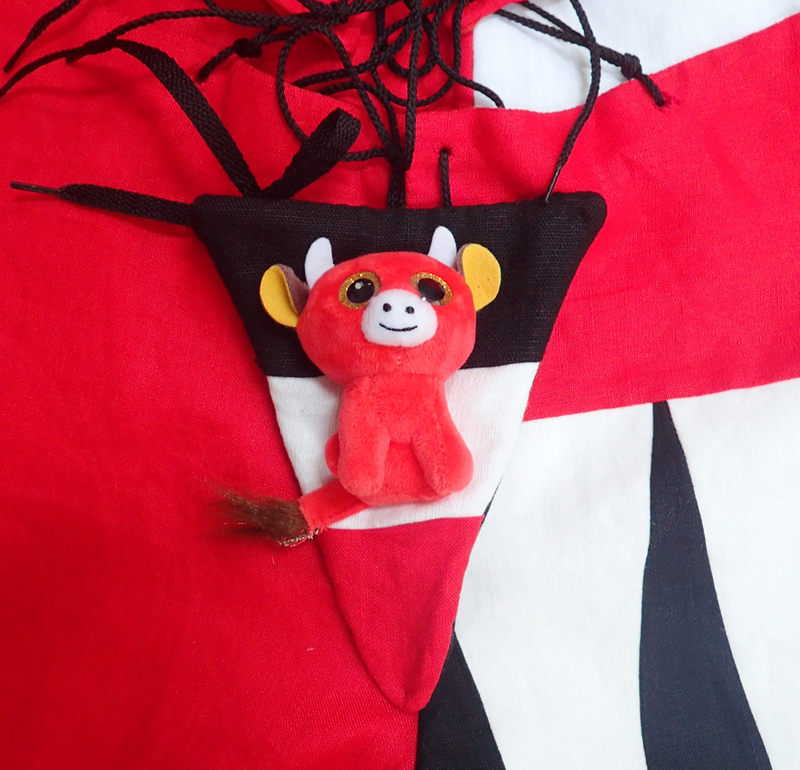 I did get around to buying stuff I could not make myself…socks and brooches. Also, a lovely plate from Eadric the Potter. Something that I could make but I don’t want to is a men’s Viking tunic from the Hooded Hare. 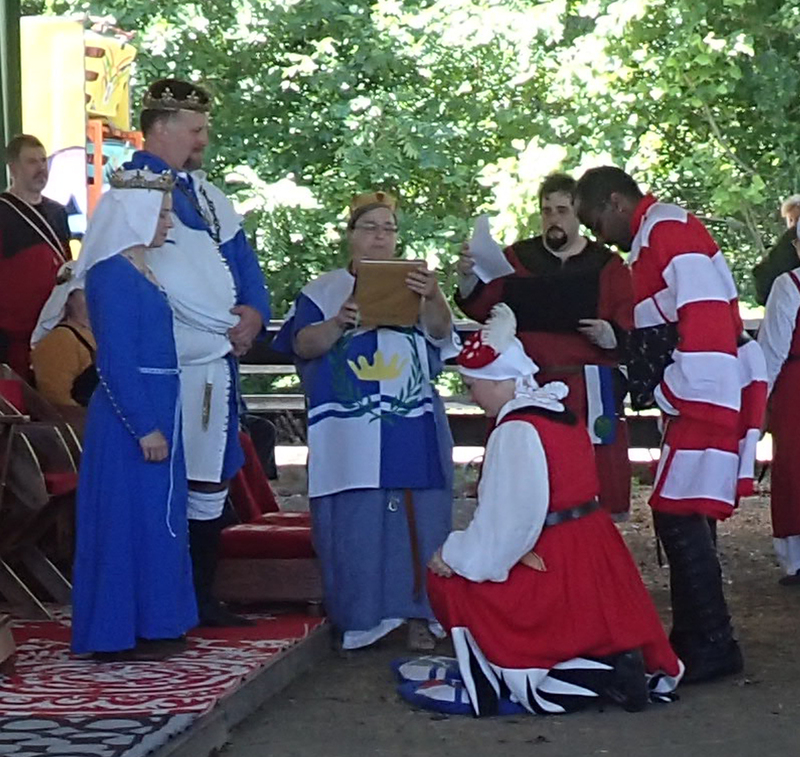 I’d never been in the shop before and I can say that it’s some of the best value for the money at Pennsic. If you calculate the price for the linen and trim alone, it’s not worth the sewing time to make a Viking tunic for my husband. I bought fabric, too, but not nearly the amount I have in the past. 96 District got most of my money. I usually spend a lot of time at University taking classes but the heat was so unbearable that I could not endure an hour or two sitting under a canvas tent. 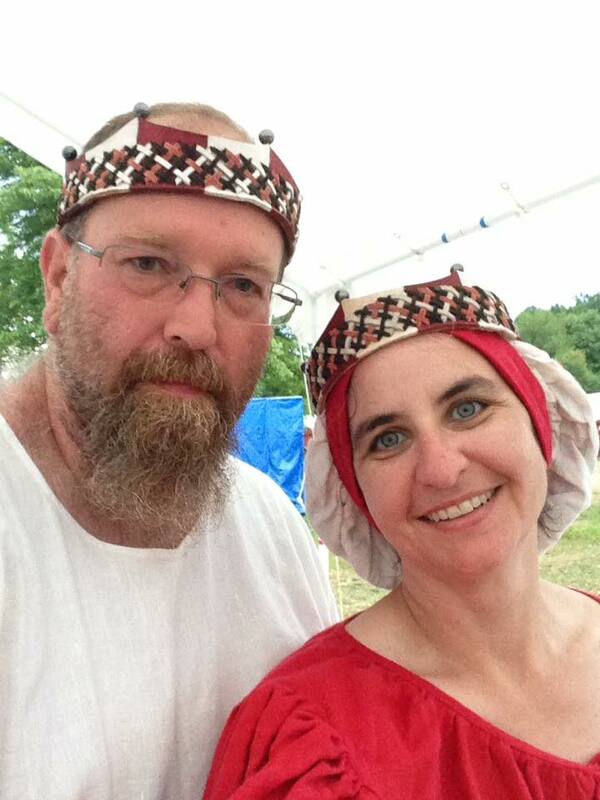 I did make it to two classes on Viking garb. 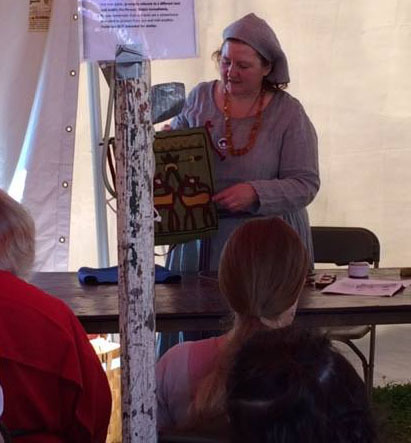 One was “Live Like a Viking to Dress Like a Viking,” taught by Vicountess Isgerdor Gulkarr, who had done a stint with some living history folks overseas. 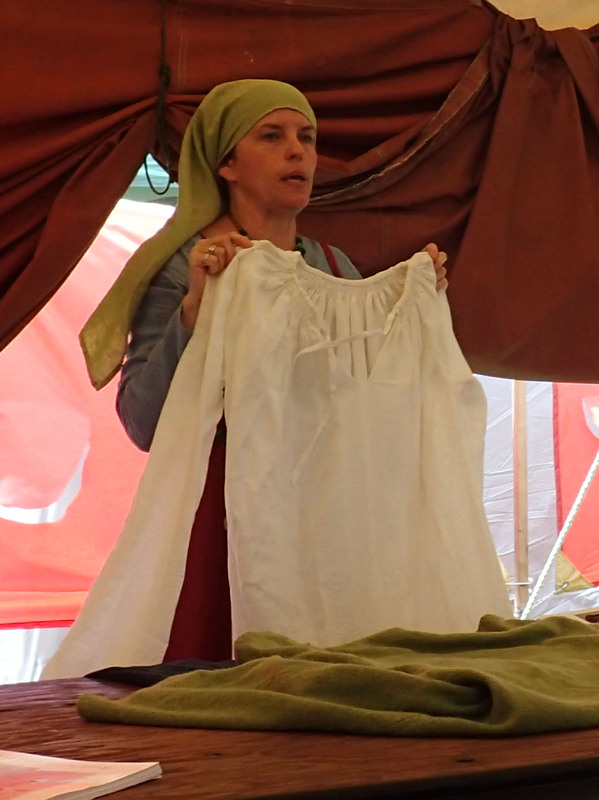 The other was “Deeper Look at Textiles & Trim of Viking Age Dress” taught by my friend Alfrun Ketta. 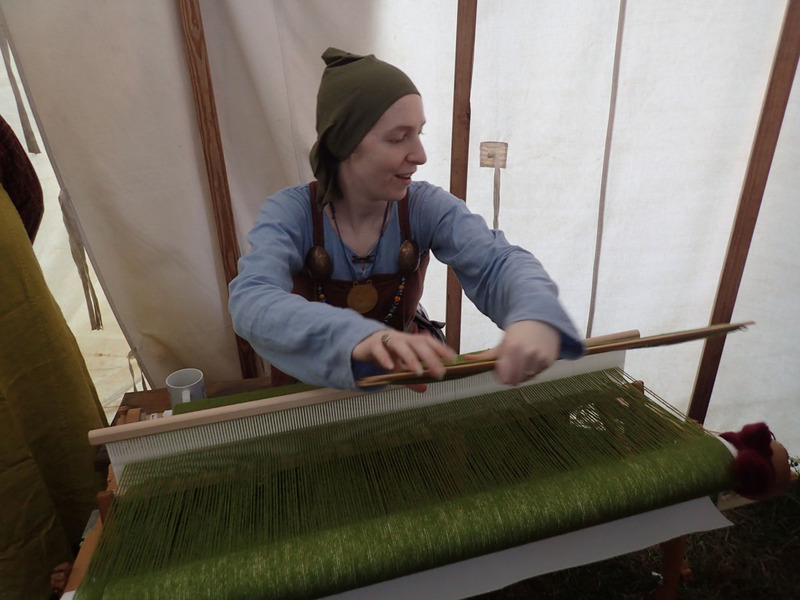 It was her new class on how to choose the right fabrics for Viking garb. It went really well. It was Viking, so of course way more folks showed up than was anticipated…I counted 45. The class had to be moved to a larger tent. I’d never seen so many people care about choosing the right fabric. It gives me hope that people are caring more about authenticity. Most of my university interaction was teaching three classes and hosting a roundtable. Two of my classes were on Viking purses. They were make-and-takes. I planned for 8 students per class. 48 people showed up for the first class! Given the response on the Viking FB group that I’m part of, I had planned for this. 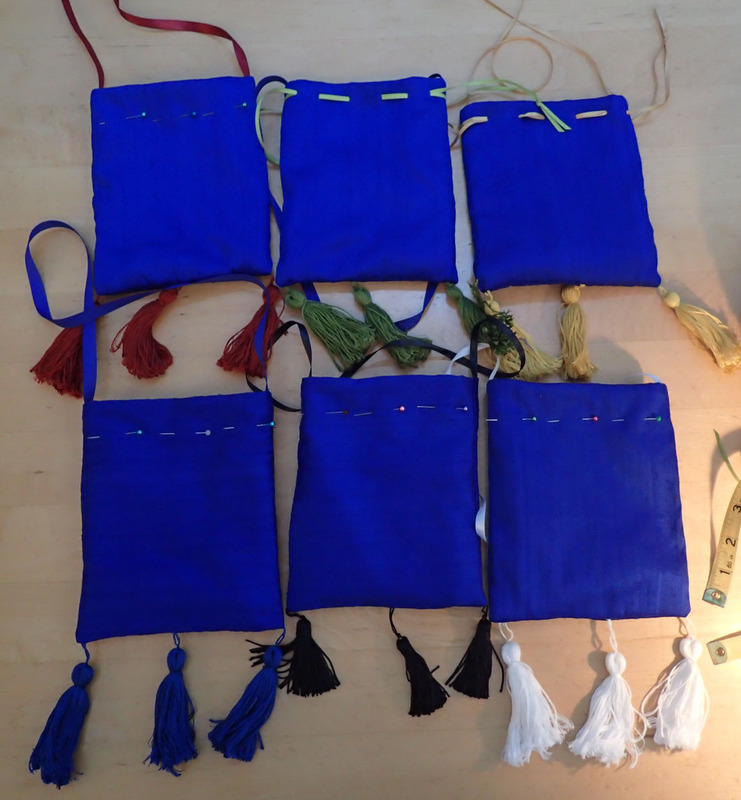 I brought 100 sets of purse handles to Pennsic and I put all the directions online. So, even if folks didn’t get into the class, they went away with handles and access to instructions. My second Viking class was at Southwind. Fewer students made the trek to this class but it was still overbooked. (Southwind has a lovely setup for giving classes, BTW.) 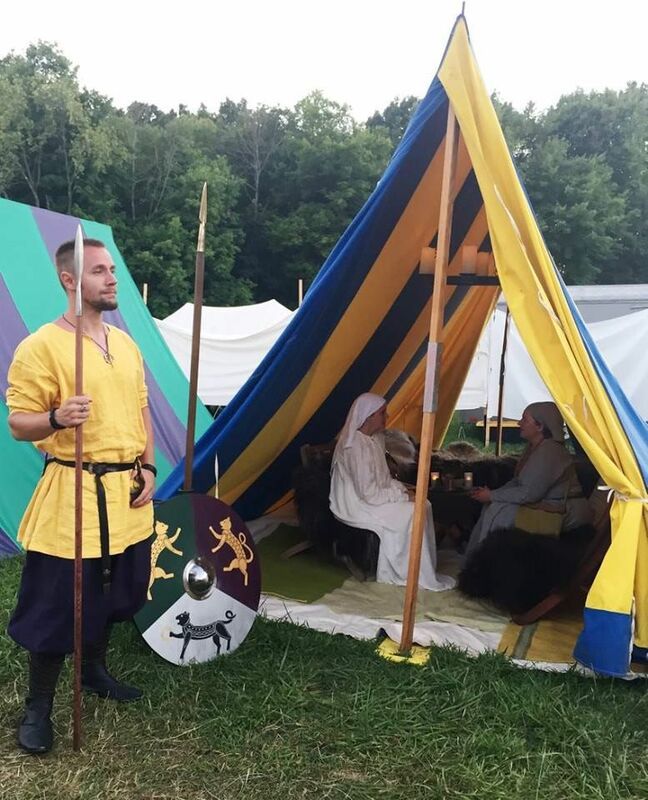 My friend, John, for whom this was his first Pennsic, showed up to take photos. 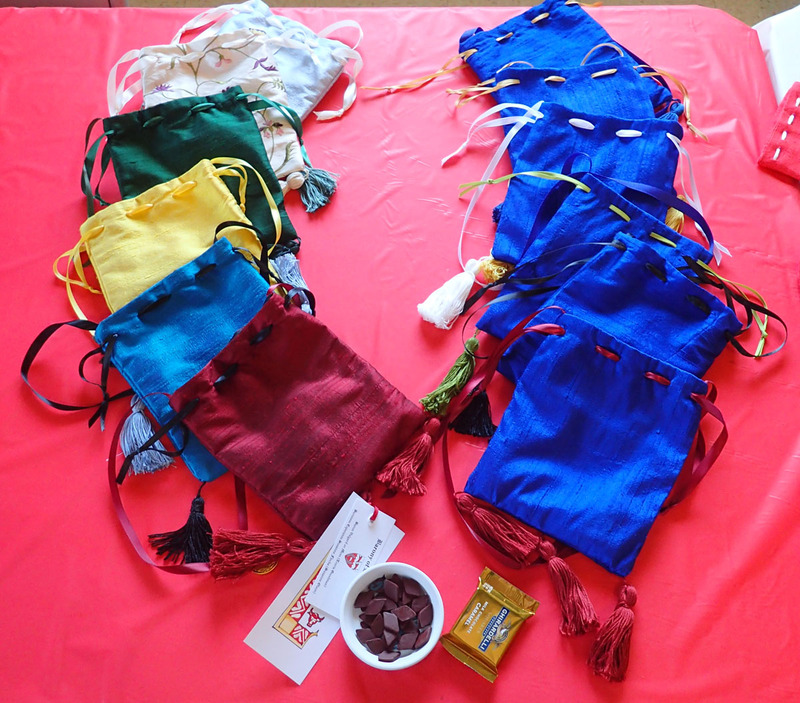 My third class was teaching the three pouchlet German bag. 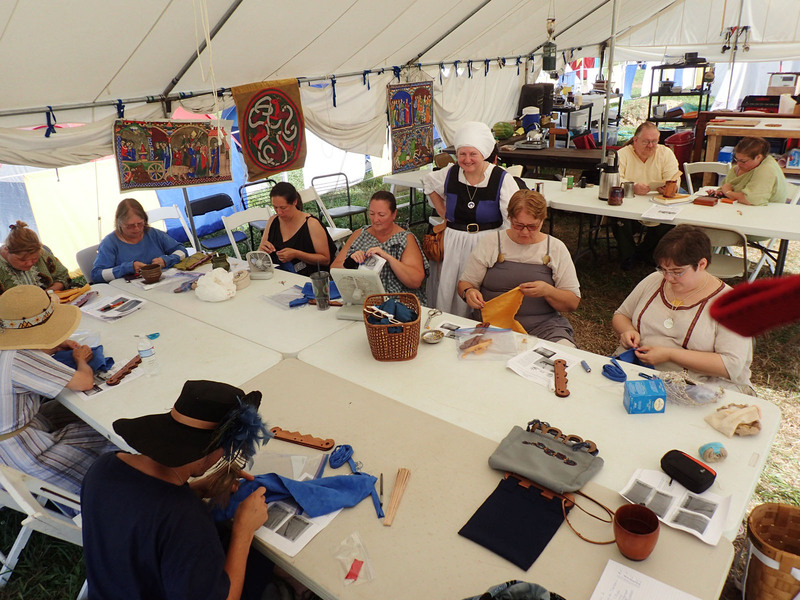 Though it was less popular than the Viking classes, there were still more people who showed up than I had kits for. My friend Claudia found some nice quality leather from an onsite vendor, so she went home with the real deal in materials. For the roundtable, only one person showed up but I imagine that was due to the heat. My overall thoughts about University is that I signed up to teach too many classes. At this time, I think I’ll only teach one class next year, which will be a lecture on German dressing from the skin out, if there’s any interest. I’m done teaching make-and-takes for a while. The prep work is brutal. 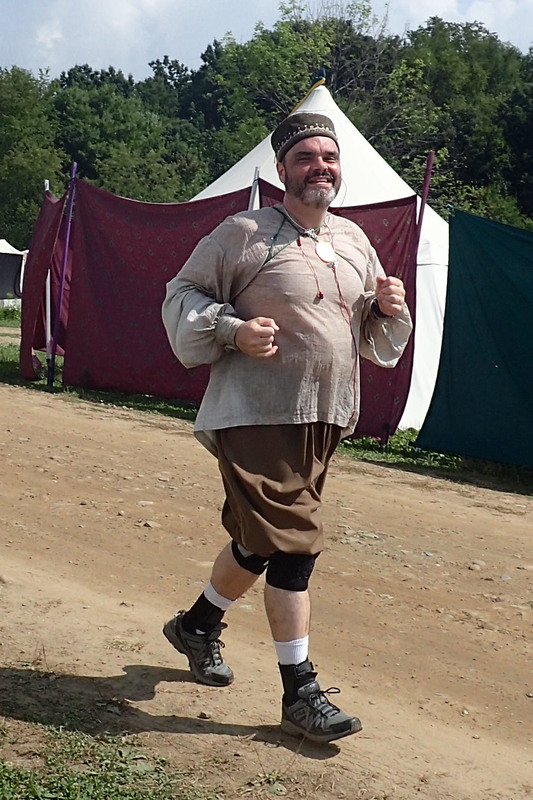 The highlights of this Pennsic were Basil running (and finishing!) the half-marathon, Jenn Culler’s vigil, the A&S Display, and the A&S War Point. Basil running the half-marathon is pretty much self-explanatory. However, the circumstances that the runners overcame were tremendous. Brutal heat and oversized gravel on the roads made the race very difficult. Only 14 people finished. (I don’t know how many started.) To put that number into perspective, over 10,800 people attended Pennsic this year. Jenn Culler’s vigil was all kinds of awesome. Glynnis played the harp. Everyone took a turn at the loom weaving Jenn’s cloak. There was a nice buffet and drinks. The vigil tent was gorgeous inside. The weather was somewhat cooler since it was in the evening. The lighting and decorations were amazing. And of course, Jenn’s elevation was way overdue so everyone was really happy to participate. 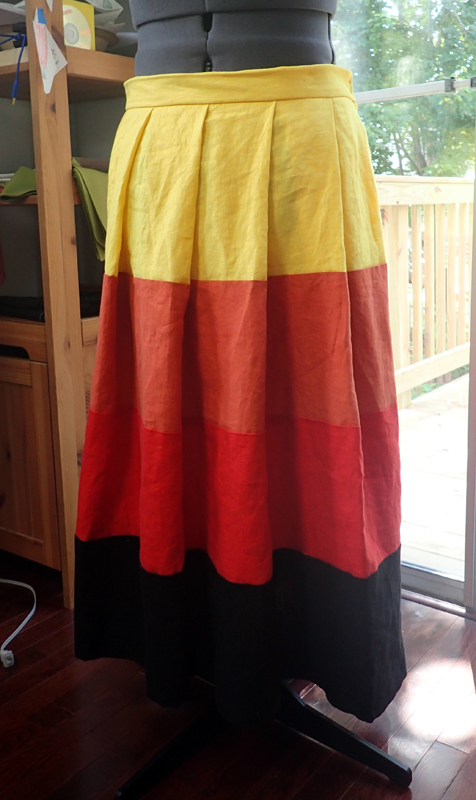 My small contribution to Jenn’s elevation was hemming Jenn’s wool apron dress and with help from Signy, finishing the seams. The A&S Display on Sunday and the A&S War Point were two sides of the same coin. It’s all A&S! 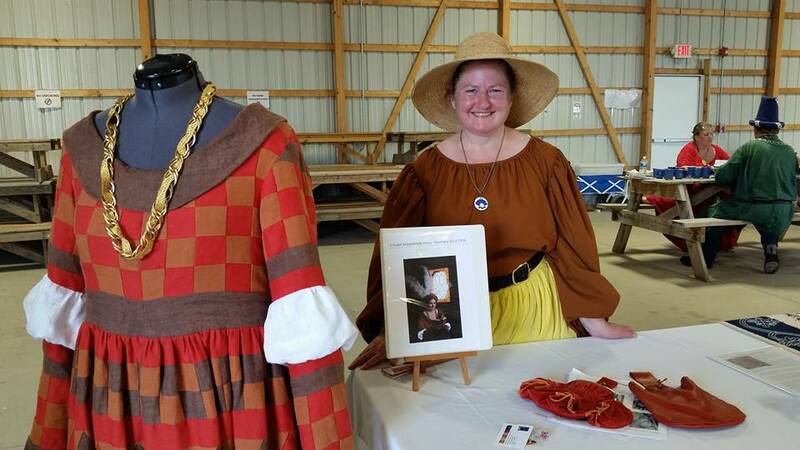 The A&S Display at Pennsic every year is the main draw for me. As Kaleeb says, it’s great to show your own projects, no matter how strange they are, because inevitably someone will come to the display and understand what you were trying to do. So many of us work away in relative isolation. 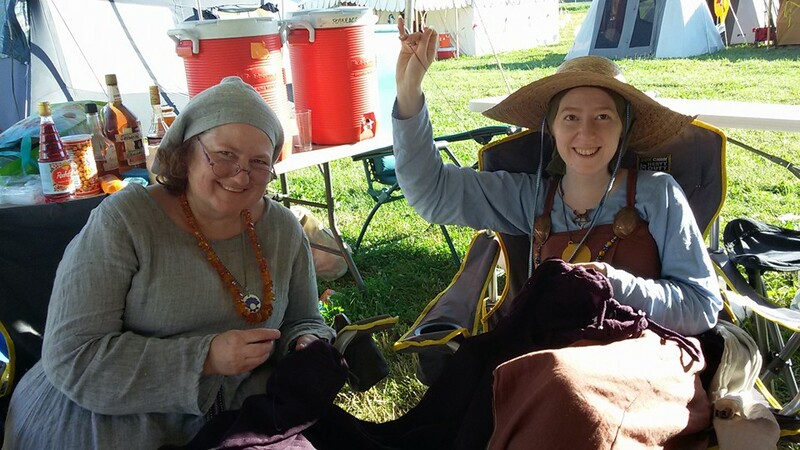 Pennsic provides us the opportunity to meet others with the same interests and perhaps learn a thing or two. The A&S War Point was a subset of the A&S Display, with some additional entries added in. This is only the second year that there was an A&S War Point. The A&S Champions for the Kingdoms and their allies displayed projects. There were about 30 of us and the level of quality was very high. 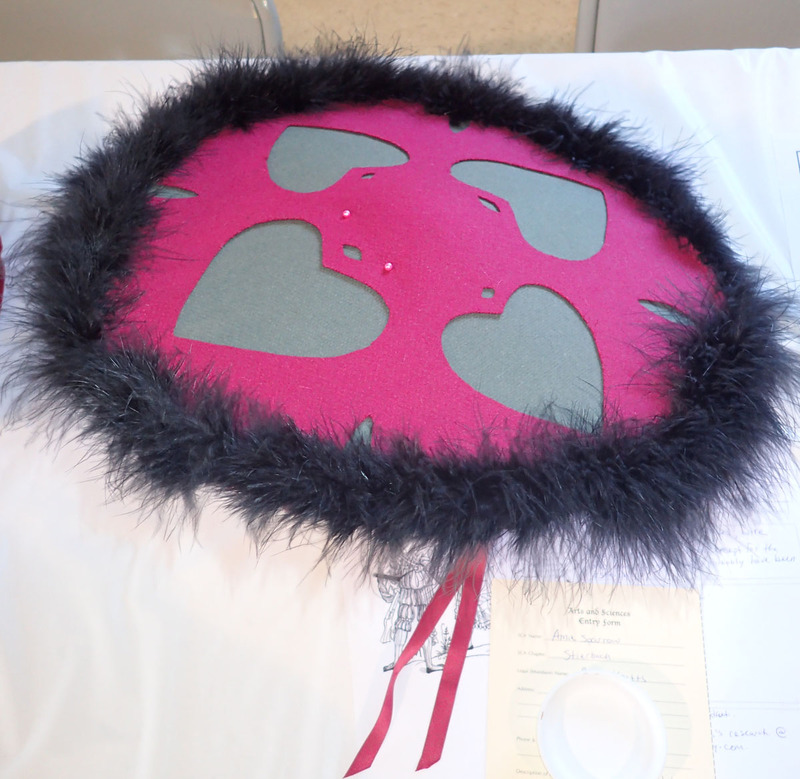 My only disappointment is that there were very few garb projects this year at either the Display or the War Point. 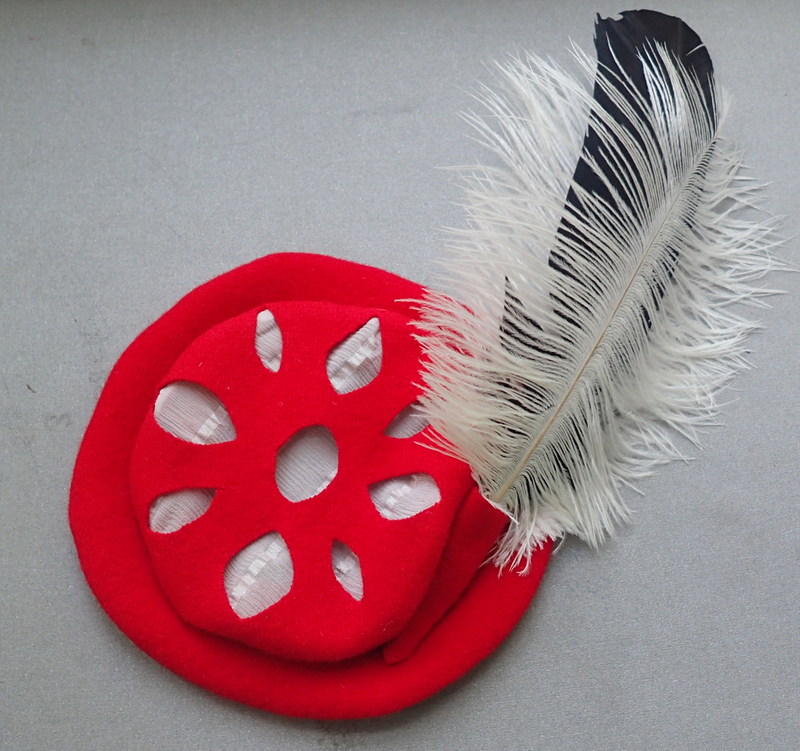 I know that the popularity of garb waxes and wanes from year to year. It seems that we are definitely in a fallow period right now. 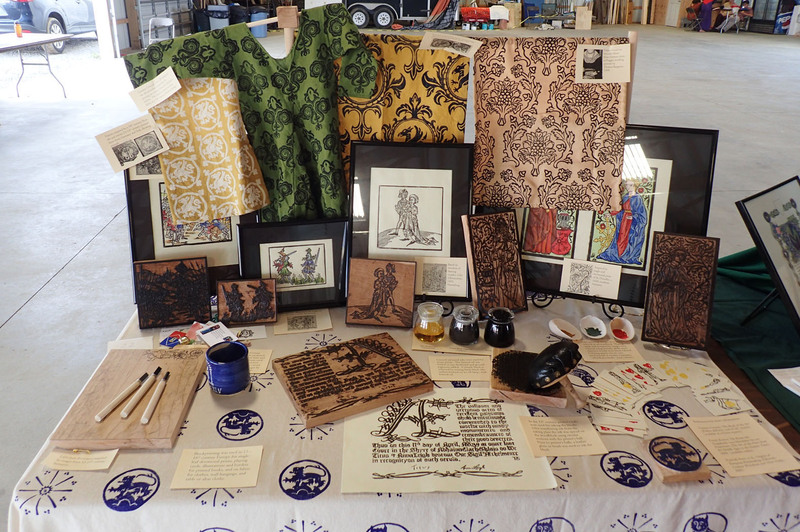 I do want to mention that the hands-down best display at the War Point was a person who showed their German woodcuts. Oh…my…lord! That was beautiful stuff. What regrets do I have this year? 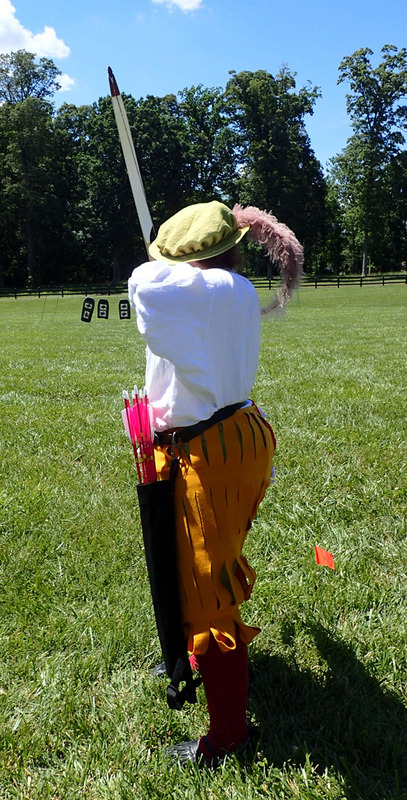 I never made it to the archery range. But there’s always next year! Yesterday was Stierbach Baronial Birthday. It was a glorious day. Lots of A&S and Archery to be had. 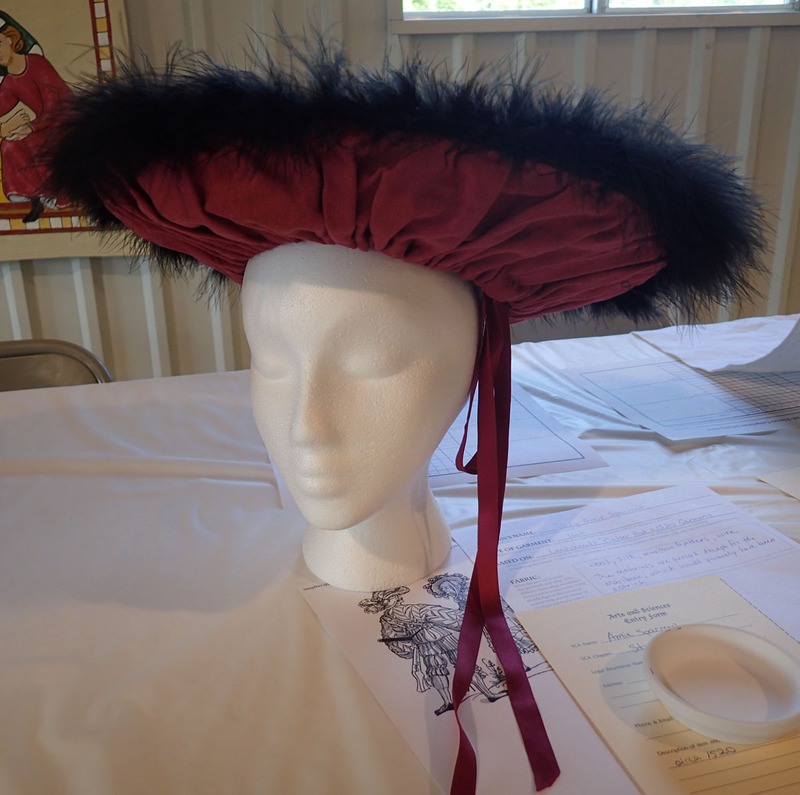 I taught a Tudor Bonnet Hat Class. Below is a photo of one of my students. I got a little archery in. And this was my entry into the Dirty Dozen Largesse Competition. 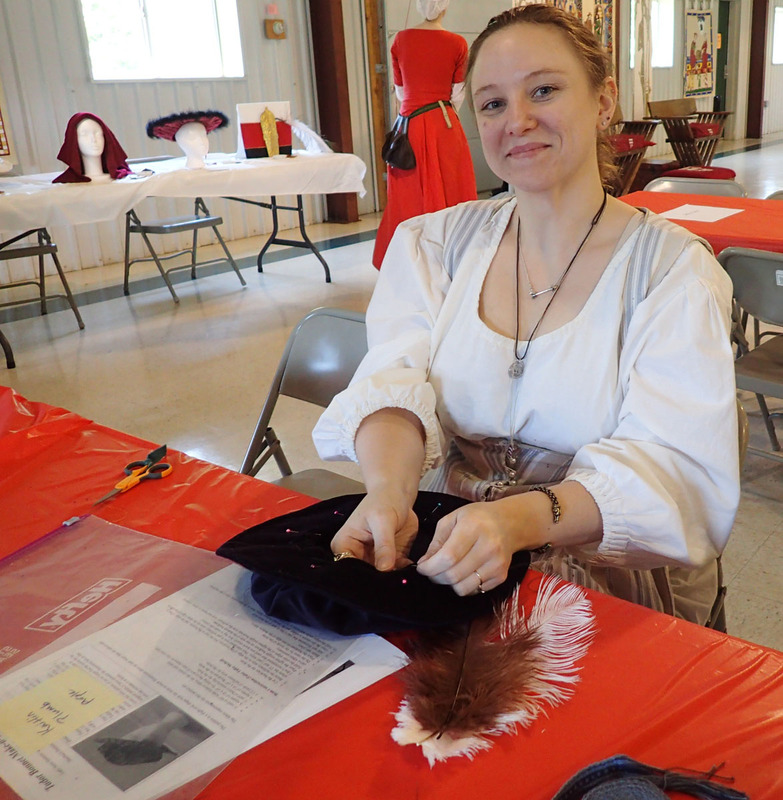 And finally, I won the hat competition with a project I hand-sewed at Pennsic a few years ago but I’ve never worn or displayed. Today I’m working on silk purses for largesse for Baronial Birthday. 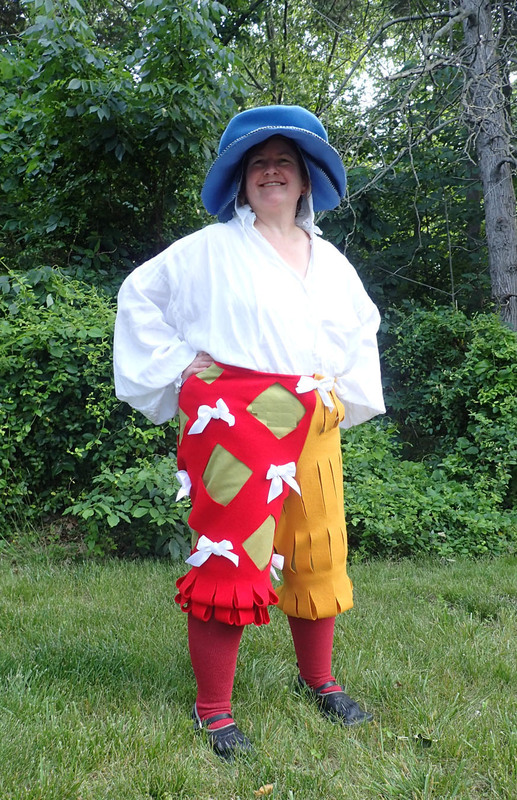 I made a pair of Landsknecht hosen today to wear on the archery field instead of having to wear a dress. I used Genoveva von Lübeck‘s directions. I used fustian for the unterhosen and fulled wool for the outside. The inspiration image is from Marion McNealy‘s German woodcut book. I love the bows! I probably won’t wear the big hat because it would interfere with pulling the bow. There are many things I will fix on the next pair. This pair was more or less a proof of concept.